Today we have a special treat for you. 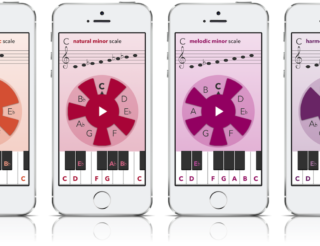 Our good friend Robert Koumans from Tipbook just announced that their ebook app series on musical instruments are currently available for free on iOS and heavily discounted on Android — but only for a limited time. Essentially, these books tell you everything you need to know about buying an instrument that perfectly matches your sound, the style of music you play, your personal, and your budget. There are also chapters on tuning, intonation, adjustment and more. The main goal of the books is to allow you to buy the best instrument you can and get the most out of your purchase, so you can make your chords sound the way you like them to. Each Tipbook title has its own separate app. I’ve been reading the volume on electric guitars (I’m an acoustic player only) and it really helped me understand what influences the sound and playability of these instruments. 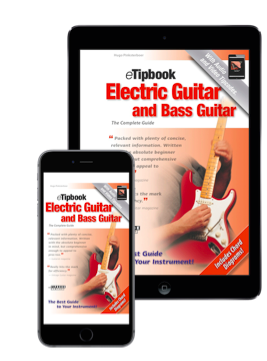 The book’s title is ‘eTipbook Electric Guitar and Bass Guitar’ and is available for free for iOS. Android version is €0.99. So, courtesy of Tipbook we have selected an excerpt for you to read from the current title on how to choose a good instrument (see below). You find many more titles on Tipbook’s website and in the App Stores. And you might wonder why they are offering these titles as individual apps, as it can be a somewhat cumbersome experience to have one app per title on a mobile device. However, with 250+ pages per app you can keep it well organised with the following 5 titles relevant to guitar players: Electric Guitar and Bass Guitar, Acoustic Guitar, Amplifiers and Effects, Music on Paper, Vocals. So, go and look for yourself. Tipbook is currently offering really good content for free (available in English and Dutch). Regular in-app purchase price $6.99. Until January 31: 2016 iOS versions free, Android €0.99 / $0.99. on. The knowledge presented in the following chapter will help you to make a choice, covering pretty much everything there is to look at and to listen for. How a (bass) guitar sounds depends not only on the instrument itself and on the person who plays it, but also on the strings, the picks, the cables you’re using, and of course on your amp and effects. Strings, picks, and cables are explored in Chapters 6 and 7 respectively. Amplifiers and effects are covered in a Tipbook by that title. After exploring the various types of guitar finishes and bodies, this chapter covers the neck and fingerboard (page 47), the scale (string length; page 56), frets (58), tuning machines (61), the bridge (64), tremolos (67), pickups (72), tips on auditioning instruments (90), and much more. Few instruments come in as many designs as electric guitars and basses. Some are extremely versatile, created to be used in a wide variety of musical styles. Others are built for a specific type of music. Often their looks alone will tell: A heavy metal guitar looks very different from one that was designed for country music. 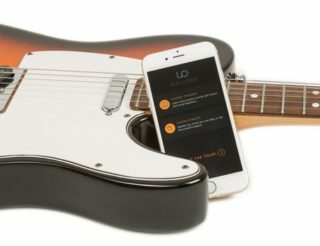 Though you can play surf music on a guitar that was built for aggressive rock, it’s usually better to use instruments for the style of music the designer had in mind. Likewise, knowing which guitar your favorite musician is playing can be a useful guide in finding the instrument that suits you best. Musicians rarely agree about anything. The following chapters won’t tell you who is right, or what is best, but rather how different experts think about different issues. You’ll discover whom you agree with only by playing, and by listening to guitars or basses, and to the people who play them. 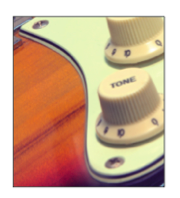 Guitar bodies can be finished with a single solid color; a natural, transparent lacquer; a two- or three-color sunburst finish; or with many other types and styles of finishes. Some companies even allow you to print your own photo or design on your instrument. Most instruments have a polyurethane finish. This is a hard and durable synthetic type of lacquer. 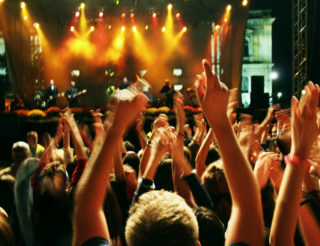 Natural finishes, such as nitrocellulose or oil, are typically used on more expensive instruments. These organic finishes, which tend to get darker with age, help bring out the instrument’s resonance. Pickguards come in lots of different colors and designs too. Laminated pickguards that show their three white- black-white plies at the edge are very popular. Most of today’s pickguards are plastic. Unlike the traditional pickguard material (i.e., celluloid) they don’t warp or expand. The hardware is usually chrome-plated, gold-plated, or black. 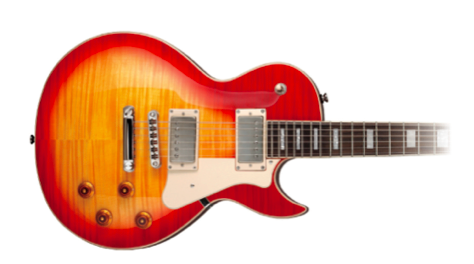 The pickups or pickup covers typically match the hardware. Vintage guitars and basses are so popular that some companies even offer brand-new ‘vintage’ instruments — artificially aged, with intentionally rusted hardware, discolored plastic parts, and skillfully damaged finishes. These instruments are generally referred to as relics. Some companies also offer vintage guitars that look as if they’ve been in someone’s attic for several decades, with hairline cracks and a yellowed pickguard. A replica is a copy of a (bass) guitar of another brand, and a reissue is a new edition of a older instrument, made by the original company. The type of wood used for the body affects both the instrument’s tone and weight. The body shape influences the looks, the balance, and the playability of the instrument. The very cheapest guitars often have a chipboard or plywood body. A body that consists of one or more pieces of solid wood helps produce more sustain and a richer sound. Generally speaking, denser types of wood promote a brighter tone and more sustain than lighter types of wood. That said, many types of wood come in different variations and qualities. Also, the way a guitar is built can completely alter some the wood’s typical characteristics, and experts don’t always agree when it comes to describing the effect of certain types of wood. The message? Always listen to the instrument as a whole, rather than focusing on the type of wood it’s made of. Still, it’s good to have some basic knowledge of the subject. Poplar, basswood, and alder are three lighter types of wood. They’re often said to help produce a warmer, fuller, fatter type of sound. Maple, at the other end of the spectrum, is very dense, and thus makes for a brighter tone. Mahogany and ash come in various weights and densities. The lighter types, again, enhance a warmer, mellower tone. Denser wood promotes a brighter, ‘airier,’ more open type of sound. Swamp ash is one of the lighter types of ash. Because of its beautiful appearance, maple is often used as top wood. It’s available in many variations (i.e., quilted maple, bird’s eye maple, and flamed or figured maple). There are companies that offer a selection of ten, fifteen, or even more types of wood. When it comes to such choices, looks often play a larger role than sound. Likewise, with some instruments the wood you get depends on the finish you want. Bodies can also be made entirely of synthetics, or carbon fiber, for example. Some players praise their consistency; others miss the depth and warmth caused by the natural inconsistencies of wood. Bodies can also be made entirely of synthetics, or carbon fiber, for example. New materials, some specifically designed for the purpose, can solve those problems, offering new opportunities for both instrument makers and players. On some instruments, the ‘wooden’ top is not real flame wood, but a thin photographic film that is applied to the body. It often takes an expert eye to distinguish such a ‘photo flame’ from the real thing, which typically has more depth and character (in sound too!). The size and shape of the body influence sound, weight, and playing comfort. Generally speaking, a thicker, heavier body increases the sustain and makes for a richer sound. A ‘heavy’ solid-body can outweigh a light one by three or four pounds. This doesn’t sound like much, but you may very well feel the difference after a couple of songs. The balance of the instrument is just as important. A neck-heavy guitar can be more tiresome to play than one that actually weighs more, but has a better balance. An uncomfortable balance can sometimes be cured, for example by relocating the strap buttons. A tip: If you usually play standing up, audition instruments standing up as well. Solidbodies aren’t completely solid. 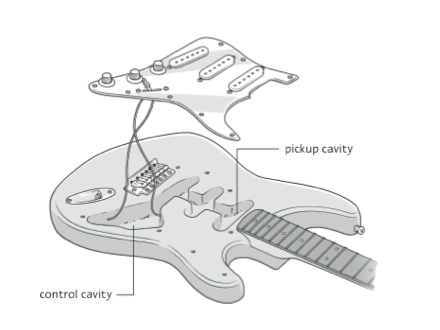 All instruments have cavities for the pickups, the wiring, and the pots, for example. for shallow-body guitars that clearly show their sound chamber through a soundhole in the top. Today, most instruments have contoured bodies with rounded edges. These designs don’t dig in your chest the way some old- style, non-contoured slab bodies do. Many guitars also have a belly cut, a cut-away section on the back of the body. The belly cut leaves a bit of room for your tummy, especially when sitting down. The accessibility of the highest frets depends on the depth of the cutaway, but also on the heel, where the neck meets the body. The less pronounced the heel is, the less it’ll be in your way when reaching for the highest notes. A thicker heel, on the other hand, is said to make for a more solid, full-bodied sound — just like a heavier body or a thicker neck. Hollow-body instruments come with shallow and deep bodies, with one or two cutaways, with or without a center block, and in various types of wood. Traditionally, jazz players favor a big-box guitar or jazz box. These instruments are often 17″ wide at the lower bout, and about 3.5″ to 4.5″ deep. (This dimension is known as the rim thickness). The deeper the body is, the more sensitive it is to feedback. This explains why guitarists in loud bands usually opt for shallower models. These guitars often come with a built-in center block that reduces feedback even more, besides enhancing the instrument’s sustain. Most hollow-body basses have a similar center block. Some instruments leave a little space between this sustain block and the top, promoting the acoustic qualities of the instrument. Instruments with a center block are often referred to as semisolids, while the ones without a block are indicated as semi-acoustic instruments — but the same terms are used for different types of instruments as well. The top is one of the most fundamental parts of a hollow-body (bass) guitar. A solid spruce top is usually said to provide the warmest, deepest, most acoustic type of sound. A maple top makes for a brighter tone. Laminated and pressed arched tops tend to produce a shallower and less dynamic sound than tops that are carved from a solid piece of wood. Solid tops are usually bookmatched (see page 174). A cutaway with a pointed ‘horn’ is known as a Florentine cutaway. A Venetian cutaway has a rounded shape. 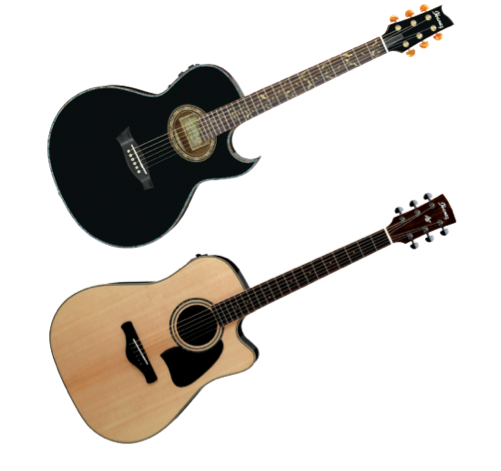 The same terms are used for acoustic guitars, shown below.